Consumer Watchdog is calling on Assembly Insurance Committee Chair Tom Daly (D - Anaheim) to withdraw legislation (AB 891) that would exempt insurance companies and banks from complying with the California Consumer Privacy Act. The Privacy Act will take effect in January and empowers consumers to prevent their personal information from being sold to other companies, as well as allowing consumers to sue reckless companies for data breaches. "At a time when consumers want more control over their private information, Assemblymember Daly is letting insurance companies and big banks off the hook," said Adam Scow of Consumer Watchdog. "Companies that possess our most sensitive health and financial information must be held responsible and liable for guarding our data. If this legislation succeeds, Tom Daly will go down in history because he will have permitted a wholesale invasion of the privacy of California policyholders." State finance reports show Daly has received campaign contributions of $183,000 from insurance companies such as Anthem, Allstate, and Prudential. The list of contributors can be viewed here. Members of the Assembly Insurance Committee have received more than $1.1 million from the insurance industry, which seeks an exemption from the privacy under AB 891. The bill is scheduled to be heard in the Assembly Insurance Committee Daly chairs on Wednesday. After the committee vote, Consumer Watchdog will alert the constituents of every Insurance Committee member to reveal how they voted and how much money they received from the insurance industry via email and robo-calls. Consumer Watchdog is working in partnership with the Neighborhood Assistance Corporation of America (NACA); together the groups have more than 600,000 Californians as members and subscribers. Assembly Insurance Committee members in addition to Daly include Chad Mays, Marc Berman, Frank Bigelow, Ian Calderon, Phillip Chen, Kansen Chu, Ken Cooley, Jim Cooper, Jim Frazier, Mike Gipson, Timothy Grayson, Sydney Kamlager-Dove, and Randy Voepel. 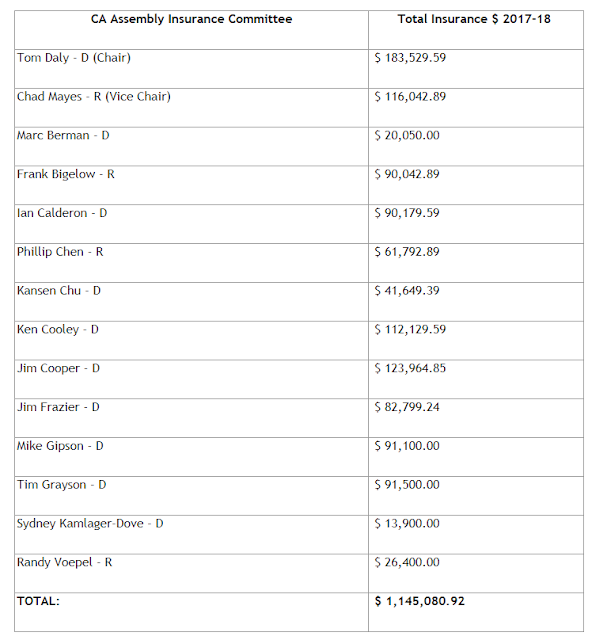 Below is a list of the contributions they have received. "There will be no privacy for the campaign contributions and votes of legislators who vote for violations of our privacy," said Consumer Watchdog President Jamie Court. "If legislators care as much about our privacy as their own then they will not vote for this bill." In its formal opposition letter to AB 891, Consumer Watchdog counsel Michael Mattoch noted that, "In a deception of Orwellian proportions, this measure, billed as the Insurance Information Privacy Act, is simply a get out of jail free card to the entire insurance and financial services industry. Where the CCPA makes clear what any business must do to protect consumers, pre-existing law states what insurance and financial services businesses may do." The opposition letter can be read here. The letter continued that, if AB 891 becomes law, "all consumers' personal financial data will remain vulnerable to outdated security procedures and hacking. Consumers will be denied meaningful control over their own information and a private right of action to recover damages from a data breach related to their finances." "Daly's bill is yet another dangerous example of the influence of money in government," added Scow. "We call on him to start protecting Californians' privacy by dropping his bill now."